Take me straight to the map! The Might Have Been Map is simply that - a map showing seriously proposed motorway schemes made by official bodies, either by national or by local government since 1958. This is combined with a map of the actually constructed motorways to give us a look at what "Might Have Been", if the schemes had been built as proposed. That's the date the Preston Bypass, Britain's first motorway opened. Prior to this date, many schemes that were proposed would simply make no sense when combined with later proposals. Pathetic Motorways will take a look at some of the very early motorway schemes at a future date. What problems are there with the map? As you can imagine, there have been lots of proposed schemes in the last 50 years, and some plans have been succeeded by later plans that effectively do the same job. Well, decisions have had to be taken with regard to showing plans that use similar transport corridors. For example, the original plan for Midlands Link Motorway (now M6 between M5 and M1) was to use the M45 to connect with the M1, rather than the present more northerly route. The original scheme and the existing motorway make no sense when seen together, so the original scheme is not shown. On the other hand, if the M64 had been built, it is entirely possible, all other things being equal, that there would have been less need to build M6 Toll, so it may never have happened. However, the two routes run in completely different corridors, and so make sense on a map seen together. Where one or more partly-built schemes have been bodged together to make what we see today, then the bits of road built to "bodge" two previously separate schemes together are shown as a dotted line. This really only applies to the M25, which is half Ringway 3 and half Ringway 4, plus two "bodged" sections to try to hide that fact! How do schemes get on the map? Schemes appear on the map when they are researched sufficiently well to be featured either here on Pathetic Motorways, or alternatively over on CBRD. As more and more unbuilt or partly built schemes are researched by the two sites, then the map will be updated. No schemes will be included on the map unless they were proposed and documented by an official government body, not by pressure groups. This means that items like the Association of British Drivers' POLO scheme will not appear. What else will appear on the map? Other items that appear are extensions to existing non-pathetic motorways. To feature, these extensions must appear either within official documents, or on more than one edition of well-known mapping. Additionally, they must fulfill the criteria mentioned above with regard to making sense when combined with the built network. An example of this would be the extension of the M42 north of its current terminus near Tamworth to its originally planned terminus near Nottingham. Well, whilst most motorways planned by Central Government have had at least some research done on them (or at least we know that they exist! ), plans made by Local Authorities, or the Scottish or Welsh Offices are more difficult to get hold of. Increasingly we are finding that we don't know what we don't know! 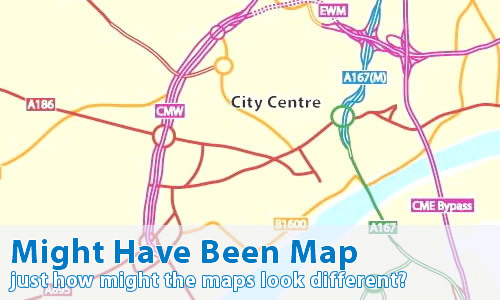 Do you know about a motorway plan within your local area, that's not included on here? Perhaps just a bypass, or a motorway link in the style of the A57(M) or A6(M). If you have any information, please contact me - I'd love to hear from you, no matter how much information you can offer. The Might Have Been Map does not cover Ireland, either in the North, or in the Republic. However, if you're interested in unbuilt plans in Northern Ireland, I can recommend the Northern Ireland Roads Site, which includes plans for the unbuilt network. OK - here's the overview map for Great Britain. Whilst navigating around the maps, keep an eye out for the tips that appear showing things to click on with more information.